Description: Includes an artbook and soundtrack CD. Packaging text in English and French. Box Text: Vincent is trapped in a nightmare, facing a choice of marrying his longtime girlfriend Katherine or moving on to the incredible blonde he just woke up next to-named Catherine! The worst part is, if he makes the wrong choice, he could end up dead. Hang out, drink, send texts, and watch the story unfold through full HD cinematics. Addictive puzzle action has you climbing fast and skirting pitfalls! Compete or cooperate with a friend! 02-12-2019 silverbow Box Text Vincent is trapped in a nightmare, facing a choice of marrying his longtime girlfriend Katherine or moving on to the incredible blonde he just woke up next to-named Catherine! The worst part is, if he makes the wrong choice, he could end up dead. Hang out, drink, send texts, and watch the story unfold through full HD cinematics. Addictive puzzle action has you climbing fast and skirting pitfalls! Compete or cooperate with a friend! 04-14-2013 artikskarab Box Text Vincent is trapped in a nightmare, facing a choice of marrying his longtime girlfriend Katherine or moving on to the incredible blonde he just woke up next to-named Catherine! The worst part is, if he makes the wrong choice, he could end up dead. Hang out, drink, send texts, and watch the story unfold through full HD cinematics. Addictive puzzle action has you climbing fast and skirting pitfalls! Compete or cooperate with a friend! 12-25-2011 scott Description Includes an artbook and soundtrack CD. 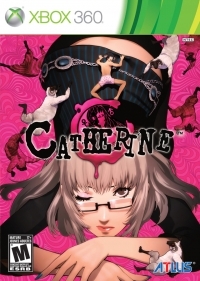 This is a list of VGCollect users who have Catherine in their Collection. This is a list of VGCollect users who have Catherine in their Sell List. This is a list of VGCollect users who have Catherine in their Wish List.